Set up:Before your lesson write words from the Bible verse on tape and then stick them to boxes, blocks, or cups. Make enough sets so that you can break your children up into teams. 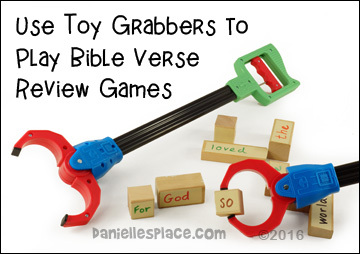 If your Bible verse has five words break your children up into teams of five or less children so that every child has a chance to pick up a block..
Place the objects with the words on them at one end of your room. Place masking tape on the floor at the other end of the room to mark starting lines for your teams. Give a grabber to each child at the beginning of each team line. On the word "go" the child at the beginning of the line should run up with his or her grabbers, grab a word, and run back to the beginning of the line and give the next child in line the grabber. When all the children in the team have a word they should then place their word in order to spell our the verse. The team that finishes first wins. 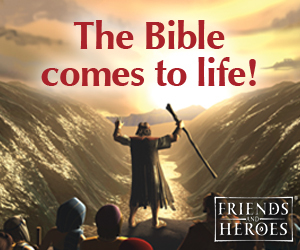 Set Up:Before your lesson collect things that relate to the Bible lesson. If you can find objects, glue images of things relating to the lesson onto small boxes or cups. 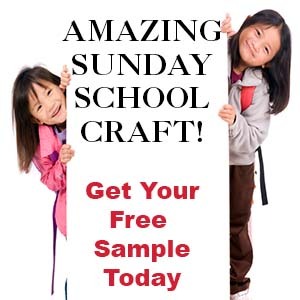 Give each child a chance to pick up one object with a grabber and bring it to you. Ask the child who brought the object how the object relates to the lesson. Keep playing until all the objects have been picked up. 1. 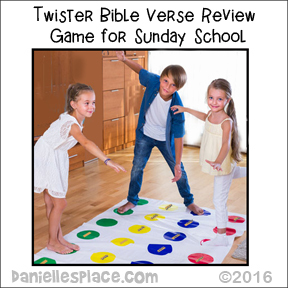 Before class label a Twister Game with words from your Bible Verse. 2. Write the words on two-inch masking tape or address labels and stick them to the circles. 3. Make a matching spinner. (If you don't want to make a spinner, you can just write the words on corresponding colored paper and pull them from a bag, or you can place masking tape with the words on them on the spinner. 1. In class have four or five children stand around the twister game. Play like Twister, except when you call out a color, say the word that is on that color. 2. If a child falls or touches the Twister game with a part of his body besides his hands or feet, he is out, and must say the whole verse. If you have very small children, just let them try to place their hands and feet on the board. Don't worry about them touching other parts of their bodies. Give all the children a certain amount of time to play. 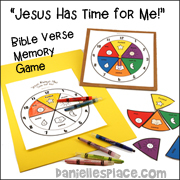 The game pictured comes from the Bible lesson "Jesus Has Time for Me!"